In 1907 Brancusi began to carve his materials directly, pioneering a new approach to sculpture. This broke with the accepted practice of modeling in clay and sending the resulting model to be enlarged in marble by specialist craftsmen. Brancusi modified these practices to his own personal vision. He worked briefly in the studio of Auguste Rodin but soon moved away from the realist approach to sculpture in which he had been trained. Instead he adopted the idea of the symbolic narrative and understood his works as forms of universal significance. This is immediately evident in The Kiss (1916). The embracing couple are schematic figures, acting as a sign of ideal union. The woman and man are almost, though not quite, indistinguishable. Like the medieval masons, he carved the block himself—hence his works are largely of a manageable scale—and believed that the completed sculpture emerged from a cooperation with the material. In the different versions of The Kiss, the original block of stone from which the figures are carved remains visible, encouraging concentration on the ideals embodied by the couple rather than their individual selves. Constantin Brancusi was born February 19, 1876, in Hobitza, Romania. He studied art at the Scoala de Meserii (school of arts and crafts) in Craiova from 1894 to 1898 and at the Scoala Natzionala de Arte Frumoase (national school of fine arts) in Bucharest from 1898 to 1901. Eager to continue his education in Paris, Brancusi arrived there in 1904 and enrolled in the Ecole des Beaux-Arts in 1905. The following year, his sculpture was shown at the Salon d’Automne, where he met Auguste Rodin. 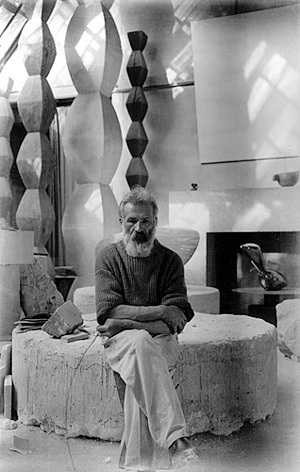 Soon after 1907, Brancusi’s mature period began. The sculptor had settled in Paris but throughout these years returned frequently to Bucharest and exhibited there almost every year. In Paris, his friends included Marcel Duchamp, Fernand Léger, Henri Matisse, Amedeo Modigliani, and Henri Rousseau. In 1913, five of Brancusi’s sculptures were included in the Armory Show in New York. Alfred Stieglitz presented the first solo show of Brancusi’s work at his gallery “291,” New York, in 1914. Brancusi was never a member of any organized artistic movement, although he associated with Francis Picabia, Tristan Tzara, and many other Dadaists in the early 1920s. In 1921, he was honored with a special issue of The Little Review. He traveled to the United States twice in 1926 to attend his solo shows at Wildenstein and at the Brummer Gallery in New York. The following year, a historic trial was initiated in the United States to determine whether Brancusi’s Bird in Spacewas liable for duty as a manufactured object or as a work of art. The court decided in 1928 that the sculpture was a work of art. Brancusi traveled extensively in the 1930s, visiting India and Egypt as well as European countries. He was commissioned to create a war memorial for a park in Turgu Jiu, Romania, in 1935, and designed a complex that included gates, tables, stools, and an Endless Column. 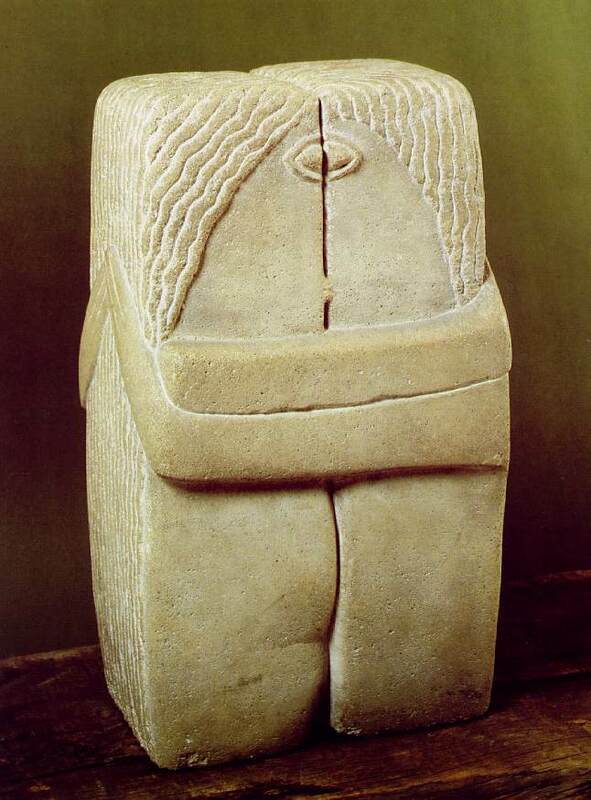 After 1939, Brancusi continued to work in Paris. His last sculpture, a plaster Grand Coq, was completed in 1949. In 1952, Brancusi became a French citizen. He died March 16, 1957, in Paris. In Sleeping Muse I (1909–10), the elegant pinching of the nose runs into the steeply arched brows, describing a form that provides a clear structure for the face. A further stage in this refinement is evident in Newborn II (1919–21), in which an angled plane suggests the screaming mouth that itself symbolizes the struggle of entering the world. Brancusi soon carried his stylization of natural forms to the point of pure abstraction, although he always found this term restrictive. Beginning of the World (ca. 1920) is the epitome of this new development. The simple, ovoid form of this work manages to embody universal aspirations, suggesting fertility and evoking ancient myths of cosmic origins, as confirmed by the title. In the mysterious Princess X (1915) a radical transformation has taken place, in which a human form, taken from an actual individual, becomes totally abstracted. A photograph survives of the first version of this sculpture, in which a woman arches her neck to catch a glimpse of herself in a mirror. The neck is exaggerated in order to convey the self-awareness of this gesture. Dissatisfied with this version, Brancusi carved back the superficial details. The head became an ovoid on an arching neck and the supporting hand is reduced to a pattern. He showed this sculpture in New York, but when the bronze version was exhibited in Paris in 1920 it was banned—to Brancusi’s apparent bewilderment—as being deliberately phallic. It was only reinstated as a result of a campaign to support his freedom of expression.